On Wednesday, Nebraska fans heard the news that standout wide receiver De’Mornay Pierson-El is out six to eight weeks with a foot injury (according to the Omaha World-Herald). Teeth were immediately gnashed throughout the Nebraska fanbase, with the World-Herald’s Dirk Chatelain forecasting that NU could be 3-4 by the time Pierson-El is fully recovered and out of the hunt for a division title. Indeed, Chatelain seems to view Pierson-El’s injury in some pretty apocalyptic terms. Is it too early for doomsday talk? Probably. Does DPE’s injury impact Riley’s chances of a building a conference champion long-term? Probably not. But barring an astounding coaching job, 2015 looks like an ambush, followed by a slog to the finish line. It’s not about winning a championship, it’s about competing with passion and dignity. It’s about avoiding dissension and humiliation. It’s about building momentum for 2016. Hold on tight, Husker fans. The past few seasons were rough. But it’s likely to get worse before it gets better. Look, Chatelain is one of the smartest and best reporters covering Nebraska football. He was the guy who had the guts to do his job and challenge Bo Pelini when circumstances required, regardless of the blowback from the fans (and the coach) he received. And Pierson-El’s injury is bad, there’s no doubt. 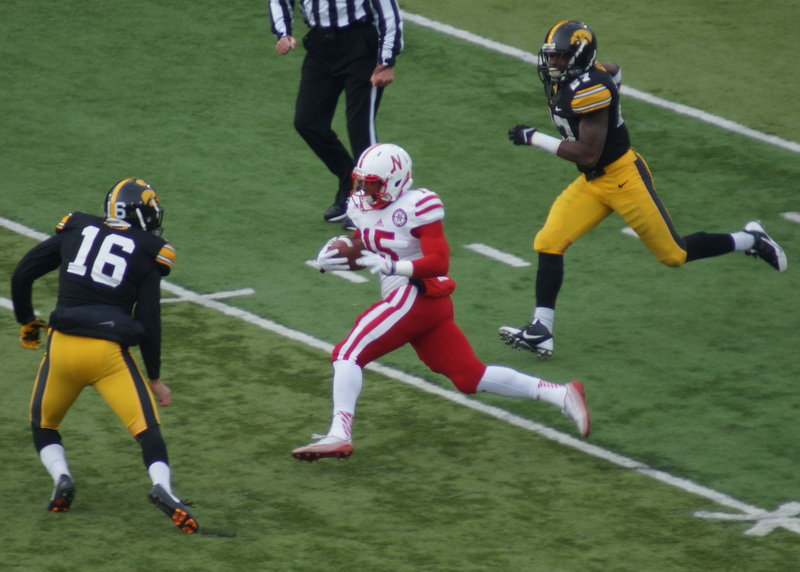 Pierson-El was easily Nebraska’s most dangerous and dynamic weapon on offense. With the departure of Ameer Abdullah, Nebraska was looking for a game-changing threat offensively, and Pierson-El was the most likely candidate to fill that role. But let’s slow the train down about Pierson-El’s injury single-handedly crushing Nebraska’s ability to compete in 2015. First of all, let’s look at the schedule. If we assume the worst-case scenario of eight weeks out, that puts him on track to return by October 10, when Nebraska hosts Wisconsin. Before then, Nebraska has a relatively arduous non-conference schedule, hosting BYU and traveling to Miami. BYU is a terrifying opening opponent because of quarterback Taysom Hill, whom both Bruce Feldman of Fox Sports and Mike Huguenin of NFL.com call a sleeper Heisman pick for 2015. Stopping Hill will be a huge task for Nebraska’s new-look defense. But Pierson-El wasn’t going to be tackling Hill – good thing, too, given the size difference. He was going to help Nebraska attack a BYU defense that ranked no. 58 nationally in total defense last year (according to CFBStats.com). Nebraska may struggle with the Cougars on opening day, but that’s a defensive struggle, one the loss of Pierson-El won’t directly affect. The game against Miami is a little trickier for Nebraska, of course. The Hurricanes ranked no. 14 nationally in total defense last year (again according to CFBStats.com), and it would be really nice for Nebraska to have Pierson-El on the field to help move the ball in South Beach. But a loss against Miami isn’t catastrophic for Nebraska. It does nothing to harm NU’s chances to win a conference title, of course. And if Nebraska can take care of business otherwise, coming out of the non-conference season at 3-1 – particularly with Pierson-El’s injury to handle – should have no detriment on NU’s confidence. Then, we get into the conference season. Nebraska gets a trip to Illinois to start the conference campaign, and given the Illini’s struggles (not to mention their embattled head coach), a win in Champaign for NU should still be expected. After Illinois, Nebraska gets Wisconsin in Lincoln. If the eight-week timetable holds, Pierson-El should be back for this game. It’s fair to expect, though, that he’ll be limited and not the dynamic weapon from last season. The Badgers are always solid and should pose a stern test for Nebraska’s divisional title chances. But the game is in Lincoln. The Badgers are also undergoing a coaching change with Paul Chryst taking over in Madison. Melvin Gordon now wears a lightning bolt instead of a motion-W on his helmet. Joel Stave will still likely be Wisconsin’s starting quarterback. And if this is Pierson-El’s first game back, Wisconsin will still have to account for him regardless of how limited his injury might make him. In other words, there’s reason to believe that Nebraska can hang with this year’s Wisconsin squad even without a fully-healthy Pierson-El. Next for Nebraska comes a trip to Minneapolis. At this point, Pierson-El should be recovering, and hopefully at least close to full speed. The Gophers, of course, have a two-game winning streak over Nebraska, so it’s not unreasonable to think this game without a fully-functional Pierson-El could be problematic. But as a smart and particularly handsome analyst has observed, much of Minnesota’s recent success against Nebraska is a result of a peculiarly-good matchup of the Gophers’ power-rushing attack against Pelini’s defensive structure. Nebraska’s new defense should neutralize that matchup advantage, allowing the relative talent of the two sides (Nebraska no. 24, Minnesota no. 64 in 2014 according to CFBMatrix) to shine through. After Minnesota, Nebraska has a home game against Northwestern and a road game against Purdue. Even with the Purples’ history against Nebraska, both of these games would have to look favorable for Nebraska even without Pierson-El. Nebraska’s next game would then be against Michigan State. That game is in Lincoln, on November 07, nearly three months after Pierson-El’s injury. Barring setbacks, there’s no reason to think Pierson-El won’t be fully fit to take the field against Sparty. Nebraska’s task to win the B1G West in Mike Riley’s first year was going to be arduous even before Pierson-El’s injury. Losing its best playmaker makes Nebraska’s job harder this year, no doubt. But there’s no reason to lower Nebraska’s 2015 goals to “avoiding dissention and humiliation” just yet.